St. Brendan was born to a noble and ancient family in Ireland in 484. He was baptised in infancy and, at age one, given into the care of St. Ita of Killeedy. When the child turned seven, he was sent to the monastery school at Tuam for more education. In 512, the same bishop who baptised him ordained Brendan to the priesthood. For nearly twenty years St. Brendan lived in monastic cells in different parts of the country and established monasteries, including one in Ardfert, his home town. In 530, he started preparing for his famous journey, the purpose of which was to find the Promised Land of the saints. On the west coast of Ireland he built a boat. He made it of branches and covered it with hides tanned in tree bark softened with butter. 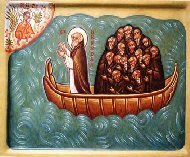 After praying on the shore, St. Brendan and 18 monks, his travel companions, sailed in the name of the Holy Trinity. They were at sea for years, stopping on small islands to rest and look for food. On the seventh year of their journey, the sailing monks reached a land that they called Paradise, or Promised Land. It was beautiful and had rich vegetation. After many years of seafaring, St. Brendan returned home. Hundreds of pilgrims came to the town of Ardfert to seek the saint’s spiritual guidance and hear stories of his amazing adventures. The holy monk, being a highly educated man, never stopped learning. He was a disciple of St. Finnian and studied in the monastic school at Clonard. The story of St. Brendan’s journey was written down and spread across Europe. St. Brendan the Navigator is considered one of the greatest travellers of ancient times.